Just like UX job descriptions, holiday gift-giving practices vary from country to country, region to region, and even office to office. Individual beliefs, cultural practices, and potential conflicts of interest aside, I usually find that a carefully chosen holiday gift helps the people you work with feel appreciated. I’ll always err on the side of buying a little something even if I’m not sure of the protocol. Whiteboard sticky notes. Yah, you read that correctly. Two UX nerd tools in one. These little guys can stick anywhere with static cling and you can write and erase as many times as necessary. Er. Mah. Gerd! Know a colleague in the midst of a big website redesign, or tackling information architecture challenges? A Website Deck is just what they need. Ever hear a fellow UXer complain that they wish they could draw better? Or that they’d like to sketch, but really, they can’t even draw straight lines? Problem solved with these UI stencils. How about a little sketching inspiration? This Pantone notebook has unlined pages and colour chips to add excitement. These sketchpadshave browser outlines and grids for sketching and paper prototyping, and this Moleskin converts hand-drawn sketches into digital files. No. Excuses. Y’all. The future is now – we even have 3D printing pens. Maybe this should be a gift for yourself. Or, ya know, your favourite UXmas contributor (hint, hint). For the consultant or constant traveller, consider this foldable silicone keyboard. Bonus: it’s waterproof, so it’s immune to coffee spills. Know an aspiring UX Unicorn? Or maybe need to transform your team into a set of magical generalists. You can’t teach them research and design and coding and everything else UX-related instantly, but they can get a taste of the unicorn life with a handy headband. Perhaps you know someone who is a proud specialist (a narwhal, if you’re familiar) and wants to show off their pride? In that case, I recommend this awesome Narwhal laptop sticker, pin, or cute mug. 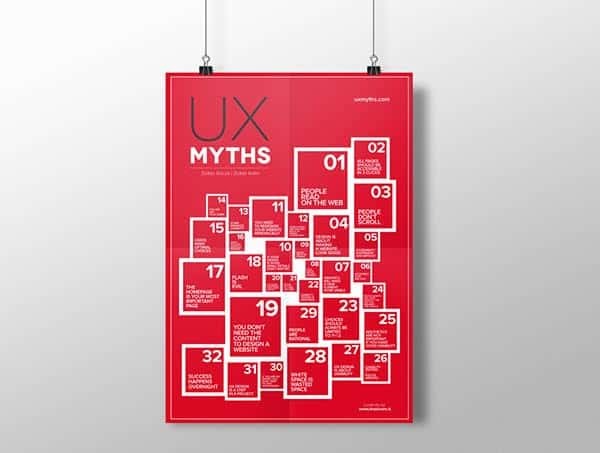 If there’s someone who you’d like to appreciate the full spectrum of user experience specialties/understand of the importance of research/could use a beautiful reminder that in fact, you are not your user; check out these posters of popular UX myths. You need to download and get them printed, so leave a little extra time – not for the last minute shopper. Have a client who has a hard time describing their business goals in terms other than, “Make it pop?” Suggest the brand card exercise and give them these brand cards to get started. Order the NSFW deck at your own peril. For a more general creative exercise, how about the oblique strategy cards? These cryptic cards were originally designed as a way to break musicians out of creative block. There are no real rules, other than that you are asked to view whatever you’re currently working on through the lens of the cards. It’s not for everyone, but can be a fun exercise with the right crowd. And if, after all those fun gifts, you still have clients who argue that research is a waste of time, maybe just write a note to your office pal on these WTF notes. Coffee lover? A coffee subscription or a coffee mug that doubles as a desk toy should do the trick. If you’re really unsure, pick out a regional treat. I live in North Carolina, so my go-to gift is usually barbeque sauce. And if you’re looking at snacks, I’m a big fan of this small-batch popcorn, available in dozens of sweet and savoury flavours. Bonus: they’re from my tiny hometown. In a pinch, you could always buy a bottle of quality wine or spirits. There are some exceptions, but most people appreciate a drink or two around the holidays, and if not they can easily regift. I hope that helps ease the office holiday pain. Happy shopping! Looking for more #UXmas cheer? We’re counting down the days to Christmas with a digital advent calendar. Join in the fun at uxmas.com or follow along on Twitter @merryuxmas for a daily UXmas gift.